The new Monster S 1200 fully embodies those values that have seen bikers’ hearts race for over 20 years. A sports icon that is totally renewed while staying faithful to the values that have made it unique: even more beautiful, even more technological, still unmistakably Monster. FRAME: The Monster 1200 uses the engine as a load-bearing element, with the trellis frame connected to the cylinder heads. A concept derived from racing, which allows for a very compact, lightweight frame, ensuring a dry weight of just 182kg and a kerb weight of 209 kg. The use of large pipes also ensures high torsional rigidity. 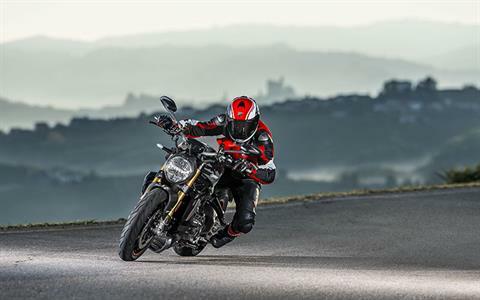 Also connected to the engine are the new single-sided swingarm, which marries perfectly with the compact 1485mm wheelbase, and brand new cast aluminium rider footpegs, separate from those of the passenger to ensure greater freedom of movement during sports riding. The rear sub-frame seat support, also directly attached to the engine, has been redesigned to create a compact structure that can also bear the new passenger footpeg support brackets. 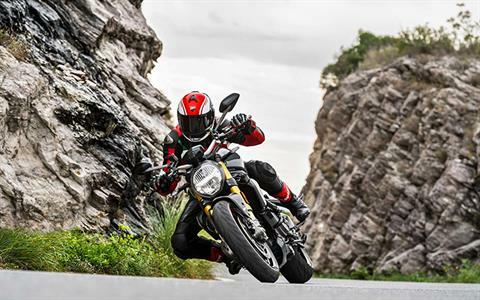 The well-balanced chassis and wide handlebar allow the Monster 1200 to combine its innate sports attitude with surprising riding ease. SUSPENSION: To fully express its sporty character and ensure maximum riding enjoyment, the Monster 1200 uses a rear shock that is directly attached to the vertical engine head and aluminium single-sided swingarm. 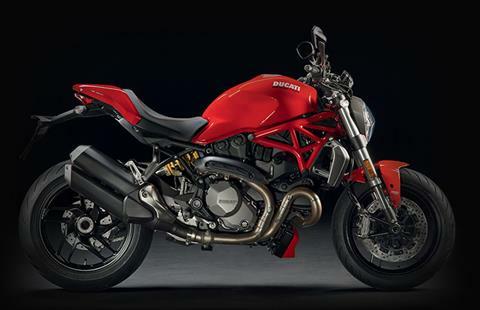 The fully adjustable suspension differs between the Monster 1200 and Monster 1200 S models. The first mounts a 42 mm Kayaba fork at the front and a Sachs shock at the rear, with adjustable spring preload and rebound damping. 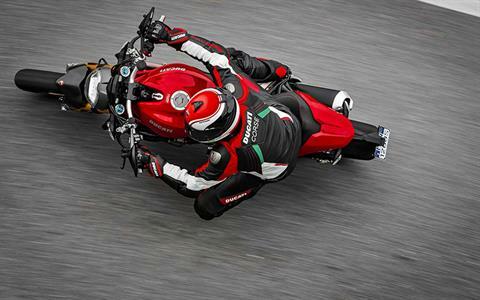 The Monster 1200 S boasts a 48mm Öhlins fork with integrated adjuster and a fully adjustable Öhlins rear shock. 1198cm3 TESTASTRETTA 11° DS: The Monster 1200 is powered by the latest evolution 1198cm³ liquid-cooled Testastretta 11° DS twin, with 4 valves per cylinder, that unleashes 150 hp at 9250 revs and maximum torque of 12.9 kgm at 7750 revs. With a lambda probe for each cylinder, it autonomously manages and optimises power delivery, while the exhaust ports, with a 50-52 mm section, form part of a 2-1-2 type system, designed with two cylinders of identical length to maximise power and distribution efficiency. 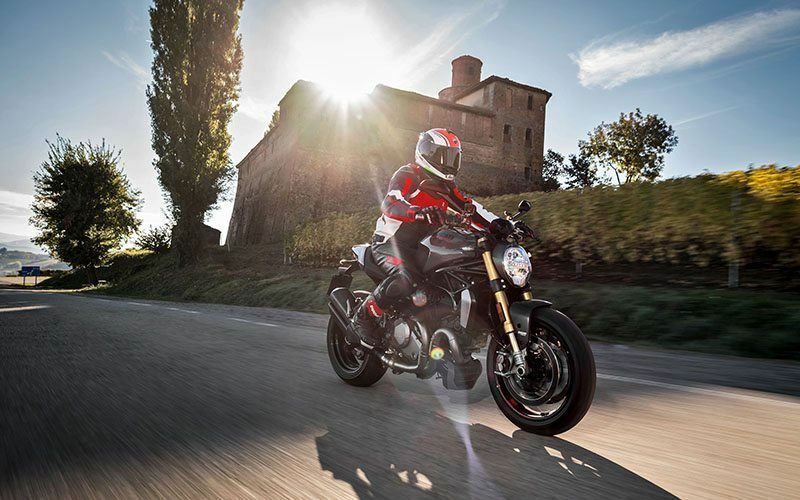 The engine of the Monster 1200 is Euro 4 homologated and competitive also in terms of its maintenance intervals, with a valve clearance check required only every 30,000 km. 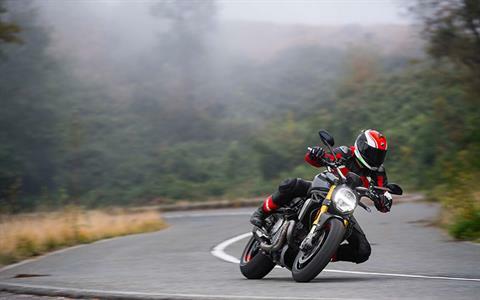 GEARING AND CLUTCH: The Monster 1200 engine is equipped with a six-speed gearbox and anti-wheelie wet clutch, which can be activated with minimal effort. Thanks to a progressive engagement system, spring preload is automatically increased, ensuring greater sensitivity and optimum comfort even in city traffic. When torque at the wheel has an opposite action, the same mechanism reduces pressure on the clutch discs, allowing them to work in the anti-wheelie sports mode, stabilising the bike even during the aggressive shifting typical of sports riding. 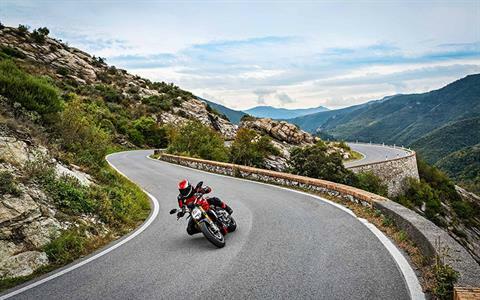 POWER AND TORQUE: The Monster 1200’s Testastretta 11° DS engine unleashes 150 hp at 9250 rpm and maximum torque of 12.9 kgm at 7750 rpm: thanks to the new throttle body and compression ratio raised to 13:1, it boasts an impressive torque curve even at low speed. Two spark plugs for each head and Mikuni Ride-by-Wire oval throttle bodies, with a diameter of 56 mm, offer greater regularity of the power delivery, for an even more enjoyable and exciting riding sensation. ERGONOMICS: The Monster 1200 guarantees maximum riding pleasure without compromise thanks to the even more powerful Testastretta 11° DS engine, fluid torque and a perfectly balanced chassis that works in harmony with the latest-generation brakes and electronics. The seat, adjustable from 795mm to 820 mm, and the wide handlebar ensure manoeuvrability and practicality in traffic, while the compact aluminium swingarm and 1485mm wheelbase make it even quicker when it comes to leaning and changes of direction, enhancing the sports riding enjoyment and increasing versatility. Front - 10-spoke light alloy, 3.50" x 17"